Posted July 11, 2010 by Jessi & filed under music, the internet, and life. 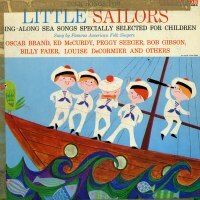 Another of the Hance childhood favorites from the rare Riverside Wonderland series, this is a compilation of sea chanteys sung and played by folk professionals. Oscar Brand stands out as a performer. So glad to hear it. Anything worthwhile on this blog seems to be about childhood musical memories! Thank you so much. My original record has been played so often it’s in rough shape. You have given me back a wonderful joy. Thank you. You’re welcome, Jay! I’m glad you found this! Great memories. Thank you for sharing the music. Thank you for posting this! This was a beloved album from my childhood back in the 60’s. I still have the vinyl stashed away somewhere, and have also made a digital copy for myself (with all of the flaws).